The Commission started this legal action because a number of zones in the UK were exceeding the PM10 limit values in 2005, 2006 and 2007. The Commission is now sending a final warning to the UK for breaching EU air quality standards. According to the latest data (provided in September 2009), two areas, namely London and Gibraltar, exceeded the daily limit value for PM10 in 2008. Gibraltar also exceeded the annual mean limit value for PM10 in 2008. This is the latest in a series of legal actions taken by the Commission against Member States following the entry into force in June 2008 of the new EU Air Quality Directive. The Directive allows Member States to request, under certain conditions and for specific parts of the country, limited extra time to meet the PM10 standards which have been in force since 2005. First warning letters were sent at the beginning of 2009 to Member States that had not by the submitted notifications for time extensions or had not notified the Commission about all air quality zones exceeding the limit values for PM10. As a result, most Member States involved submitted notifications for a time extension. The UK submitted an exemption request for eight zones including London. However, the Commission did not consider the exemption justified, as seven out of the eight zones already complied with the limit values. For London, the Commission considered that the UK had not shown that compliance with the daily PM10 limit value would be achieved by the time the exemption period expired in 2011. The UK has recently sent a further exemption request for London, which is still under assessment. However, given that zones still exceed the PM10 limit values, the Commission is sending the UK a final warning (Case number: 2008/2205). If the UK fails to take the necessary measures to comply with the legislation, the Commission could refer the case to the European Court of Justice. 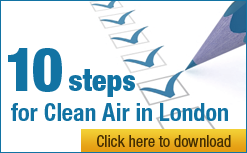 “The Campaign for Clean Air in London (CCAL) warmly welcomes the European Commission’s much needed escalation of legal action against the UK for continuing to breach air quality laws that have been in legislation since 1999 and required to be met since January 2005. “It is only surprising that the Commission has patiently waited more than 16 months to move from the first to the second stage of legal action. In future, it must escalate action much faster since UK government’s seem to understand nothing else. “The dying act of the last Government, on 3 May 2010, was to reapply for a time extension until 2011 to comply with air quality laws for dangerous airborne particles when it must have known its new case is based on little more than the assertion “we expect to comply by 2011” (with the new Government, the Mayor and the European Commission set to take the blame when the UK breaches this standard in London in late 2011 as it surely will). Ridiculously, for example, the Government’s plan (lodged on 3 May) assumed that: Phase 3 of the low emission zone (LEZ3) will be postponed until 2012 (i.e. pre-judging a consultation on a planned measure); and the western extension of the congestion charge zone (WEZ) will remain (i.e. not pre-judging a consultation on the removal of a successful existing measure on which the Mayor has (rashly) ‘staked his colours’). CCAL will be urging the Commission to reject the UK’s reapplication. “Will the new Government continue to claim litigation privilege to stop the disclosure of redacted sections of ministerial briefing papers after rulings by the Information Commissioner’s Office and more recently the Information Tribunal? Even the Government admits that those redacted sections, if disclosed, could undermine its ability to defend itself against the Commission’s legal action which has been escalated today. What is the Government hiding? “The Mayor of London is no better: his draft Air Quality Strategy is riddled with wishful thinking; and he continues deliberately to take backward steps on air quality, particularly in respect of transport, when rapid leaps forward are required. In that respect, for example, the removal of the WEZ would be a ‘double whammy’ because air quality will worsen and Transport for London will lose over £55m of net income. The best thing the Mayor has done on air quality is to tell us the scale of the problem – 4,300 premature deaths per year in London due, at least in part, to long-term exposure to dangerous airborne particles. And he still refuses to say how that number is calculated or release ward by ward and borough by borough breakdowns as CCAL has requested under Freedom of Information rules. Why has the Mayor quietly extended the deadline for responses to his draft Air Quality Strategy from 20 June to 23 July 2010? “The Commission’s action is a welcome warning shot across the bows of the incoming coalition Government that committed weakly, in its coalition document, to “work towards full compliance with European Air Quality standards” i.e. without acknowledging any responsibility for complying with these laws and with no deadline specified. At least the Liberal Democrat manifesto had said “We will aim to fully meet European air quality targets by 2012”. Where are those bold words now? “Let’s not forget either that the UK breached air quality standards for nitrogen dioxide (NO2), a toxic gas, for a whole year in London within weeks of the 1999 standard entering into legal force in January 2010. “We need: the Government to respond immediately by publishing national and regional estimates for the number of premature deaths due to long-term exposure to dangerous airborne particles (as the House of Commons cross-party Environmental Audit Committee demanded in March this year); and the Government and the Mayor to introduce urgently meaningful measures that will tackle a problem causing more early deaths than alcoholism, obesity or passive smoking. Action now would have the added benefit of kick-starting green industries. 1. The European Commission started infringement proceedings on 29 January 2009 against 10 Member States, including the United Kingdom, for failing to comply with the European Union’s (EU’s) air quality standard for dangerous airborne particles known as PM10. Note: “data (which includes the nitrogen dioxide (NO2) diffusion tube sites) is no longer relied on and is used merely for research purposes”. Legal standard from 1 January 2010 is 40 micrograms per cubic metre. This typically involves sending a Member State (MS) a first and a final written warning (Letter of Formal Notice and Reasoned Opinion respectively) before the Commission takes the MS to the European Court of Justice for a decision requiring the MS to remedy the legal breach. If the MS still fails to comply, the Commission can issue again a first and a final written warning (Letter of Formal Notice and Reasoned Opinion respectively) before asking the European Court of Justice to impose unlimited lump sum and daily fines on the MS pending full compliance. 8. Two central London local authorities, Camden and City of London have written to the UK Government expressing concerns about the likelihood of the UK complying with EU limit values in London by 2011. Copies of those letters are available on the Campaign website.